Microscopic observations of unstained live cells are vital for cell cultivation applications, and a novel phase contrast technique known as inversion contrast  now enables clear, 3D observation of cells such as induced pluripotent stem cells. Leading the way for discoveries and applications in the area of stem cell research, the Nobel Prize in Physiology or Medicine 2012 was awarded jointly to Sir John B. Gurdon and Shinya Yamanaka "for the discovery that mature cells can be reprogrammed to become pluripotent" . 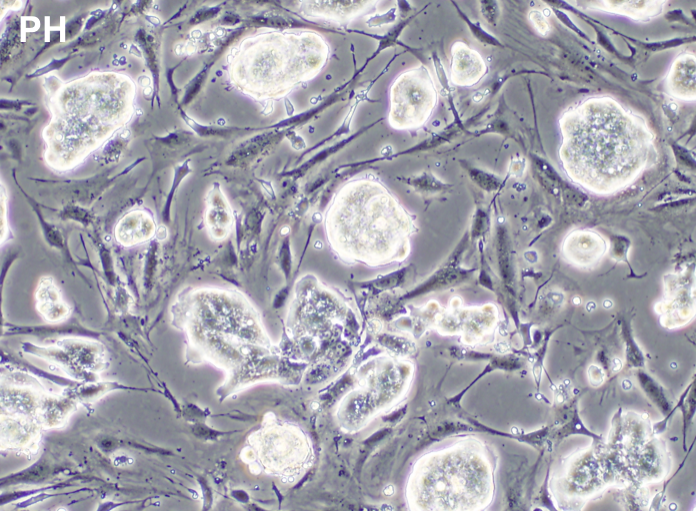 The scientists found that it was possible to reprogramme mature cells to become induced pluripotent stem cells (iPS cells), which have the capacity to differentiate into any one of the diverse cells that form the body. Understandably, this has created strong hopes for truly understanding diseases through developing accurate models, and even treating diseases with regenerative medicine, growing tissue or complete organs that match the patient and bypass the challenges associated with immune rejection. A range of tools is available to support these aims, from automated cell counters to specialised cell culture microscopes. 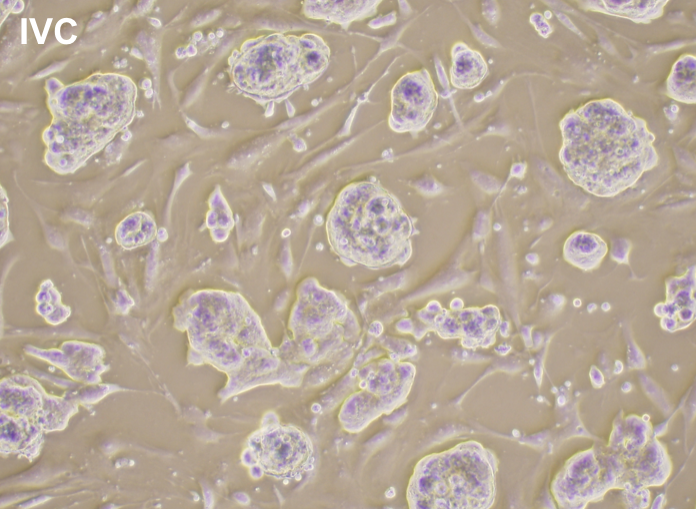 With its speed and accessibility, light microscopy is particularly vital, since the ability to clearly observe and document stem cells as they grow, proliferate and differentiate is central to observing the progress of cell cultures. However, this approach has one important limitation. Known as phase objects, live, unstained cells such as those in culture do not absorb light, and many structures are therefore invisible under standard brightfield microscopy. Still, when light passes through these transparent samples, it does undergo a phase shift, and specialised illumination methods – including phase contrast and the Hoffman modulation contrast method  – are capable of transforming phase shifts into a light intensity pattern to enhance image contrast. Unfortunately, both methods fall short of achieving optimum image quality, giving rise to artefacts that interfere with the detailed observation of sample structures. While the application of phase contrast leads to a halo effect around the edge of the phase object thus obscuring the outline, the Hoffman modulation contrast method instead introduces a shadow in the direction determined by the equipment set up. The latest research efforts have focused on overcoming these limitations, and a new contrast technique known as inversion contrast (IVC) has been developed by Olympus. This novel method extends phase contrast illumination technology to create clear images with enhanced 3D information to deliver a greater level of optical information from a sample. Both halos and directional shadows are removed through the unique setup of IVC, which is explained in greater detail in reference . 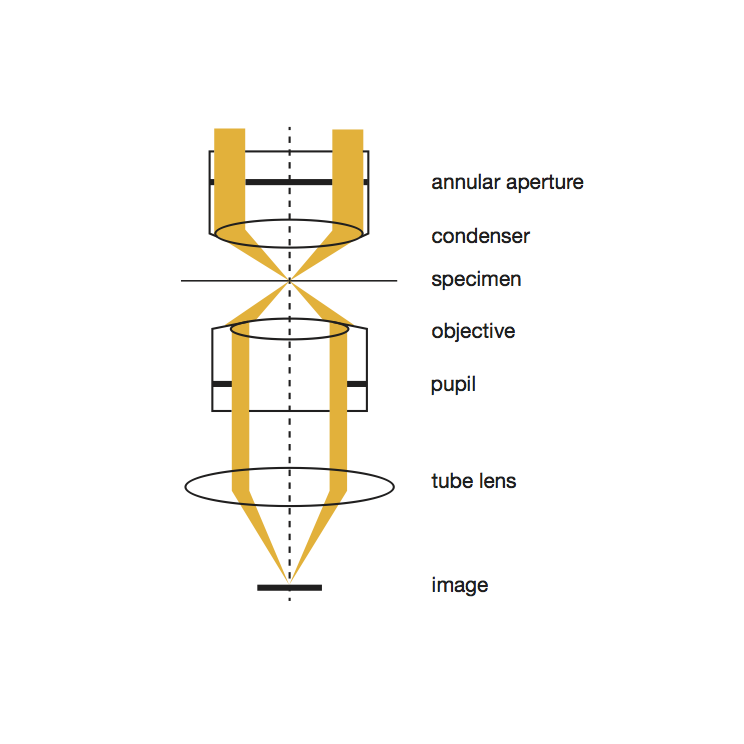 Essentially, an annular aperture is inserted into the light path at the front focal plane of the condenser (Fig. 1). Since the aperture is larger than that used in standard phase contrast (the outer slit diameter is 10~20% larger than the pupil size and the inner slit diameter is 1~10% smaller than the pupil size), after passing through the sample, the beam illuminates the edge of the objective’s pupil. Therefore, only light passing through the sample at a small angle passes through the objective, whereas light at a large angle does not. When the sample has phase variation, the direction of the light passing through the sample changes. As a result, the image of the annular aperture is shifted slightly from the position of the pupil of the objective, and the area of the light flux passing through the objective increases. The increased light forms an image devoid of halos, and with the concentric arrangement of annular aperture and objective, the setup is independent of phase shift direction, eliminating directional shadows. 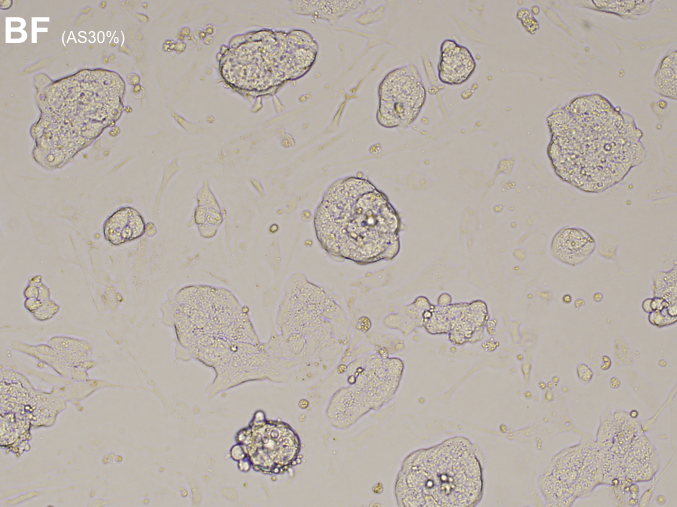 The contrast is also inverted across the focal plane and the depth of field is reduced, facilitating the morphological analysis of 3D cells such as iPS cell colonies. Clearly observing iPS cell colonies, it is possible to detect changes in morphology suggesting cellular health or differentiation. Significantly, the IVC method has been applied to visualise the outline and structure of mouse iPS cells (iPS-MEF-Ng-20D-17, Kyoto University), capturing the 3D nature of the cells when compared to brightfield and phase contrast (Fig. 2) . Interestingly, IVC has been found to be particularly ideal for distinguishing iPS cells from the surrounding feeder cells, as the contrast of the feeder cells is lower due to their flatter morphology, highlighting the iPS cells against the background. Removing the interference of halos or directional shadows that appear when using standard phase contrast illumination, the novel IVC technique developed by Olympus presents a wealth of benefits for observing and documenting cell cultures. Continuing to drive recent advances in the areas of regenerative medicine and stem cell research, this method will become part of a complete range of cell culture technologies centred on Olympus’ optical expertise - including the CKX53 cell culture microscope - that are set to play an important role in tomorrow’s discoveries. Wolfgang Hempell and Dr Joachim Kirschner are with Olympus Europe.